NEW! 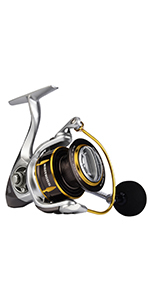 KastKing Sharky Baitfeeder III is a unique baitfeeder style fishing reel with classic front and rear drag functions. 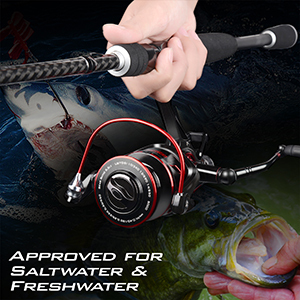 Approved for freshwater and saltwater fishing. 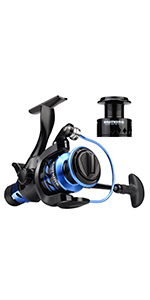 DURABLE-Each Sharky Baitfeeder III live liner fishing reels have 10 + 1 shielded stainless steel ball bearings, precision alloy gears with a 5.5:1 gear ratio and a stainless steel mainshaft. 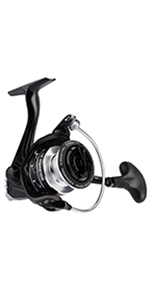 POWERFUL-The Sharky Baitfeeder spinning reels have carbon fiber drag washers for up to 26.5 Lbs/ 12 Kg of the smoothest fishing reel carbon drag on the fishing tackle market. 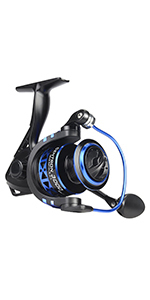 INSPIRED DESIGN- The KastKing reel features a CNC aluminum Shark Fin Braid Ready Spool, high modulus corrosion-free graphite body, and computer balanced rotor. 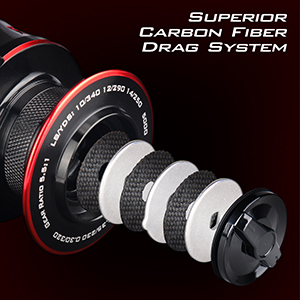 Also comes with a spare high strength graphite spool. 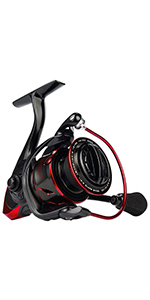 VERSATILE - KastKing Sharky Baitfeeder III has a black and red color scheme, and are equipped with interchangeable right or left hand handle with sure grip T-handle for great spinning reel performance. KastKing does it again! The all new and improved KastKing Sharky swims into the baitfeeder fishing reel scene as the KastKing Sharky Baitfeeder III spinning reel. 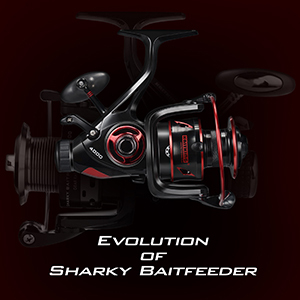 Sharky Baitfeeder III features 10+1 shielded stainless steel ball bearings, carbon fiber front drag with up to 26.5 Lbs of drag power, and a baitfeeder rear drag system for live lining live bait or drifting cut bait. Light weight yet powerful for big game saltwater fishing or freshwater fishing. T-grip aluminum handle, CNC machined aluminum Shark Fin braid ready spool, stainless steel main shaft. 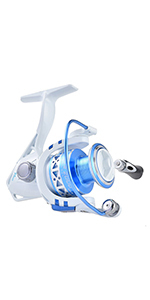 KastKing Sharky Baitfeeder III live liner reel has stainless steel main shaft, precision matched gears and a powerful 5.5:1 (5.1:1 for 3000 model) gear ratio. 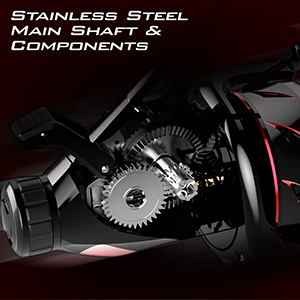 A max drag rating of 26.5 Lbs along with the dependable high quality brass drive gear and the premium carbon fiber drag washers deliver impressive power. 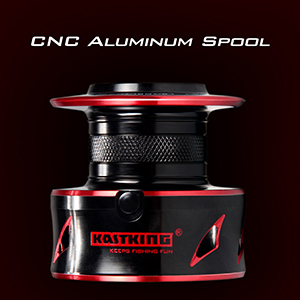 CNC aluminum Shark Fin Braid Ready Spool, with a spare spool for great value. haven't fished with it yet but seems all I expected, mine works great and balances perfect on my ugly stick. not a lightweight but I wasn't expecting that , should work great for a backup on trip to Canada chasing walleye and northerns. Still a little early to tell haven't put it to the test yet but great quality for the money. bait feeder feature very convenient. So far solid as a rock!!! Caught some nice big Carp today on this reel. I was impressed. Baitfeeder worked EXCELLENT and reel was smooth. Put 30lb braid and could cast with ease. I am Shimano man but If this reel holds up I will be switching to all Kastking baitfeeders in all sizes. I was a little skeptical in the beginning but after using it today I am very impressed.